The Woahink Lake east boat ramp near Florence, Oregon is a great place to go if you want to use up some air in your tanks after diving the north jetty on the Siulsaw River (either the SCUBA park or further out on the jetty), you want to rinse your gear off in fresh water, you need to test some new equipment out in a forgiving environment, or you want to work on some skills. The site is used often by local dive shops for open water and rescue diver courses although the site is big enough to accommodate several large groups diving at the same time. Visibility is usually 20 feet before the water gets stirred up. The bottom has a lot of silt that is easy to stir up and reduce visibility down to 5-10 feet. The silt settles quickly though. The main attractions at this site are a jumble of logs off to the right of the boat ramp and a sunken kayak a few hundred feet in front of the boat ramp. There are several conveniently located picnic tables next to the parking lot where you can assemble your equipment and gear up. 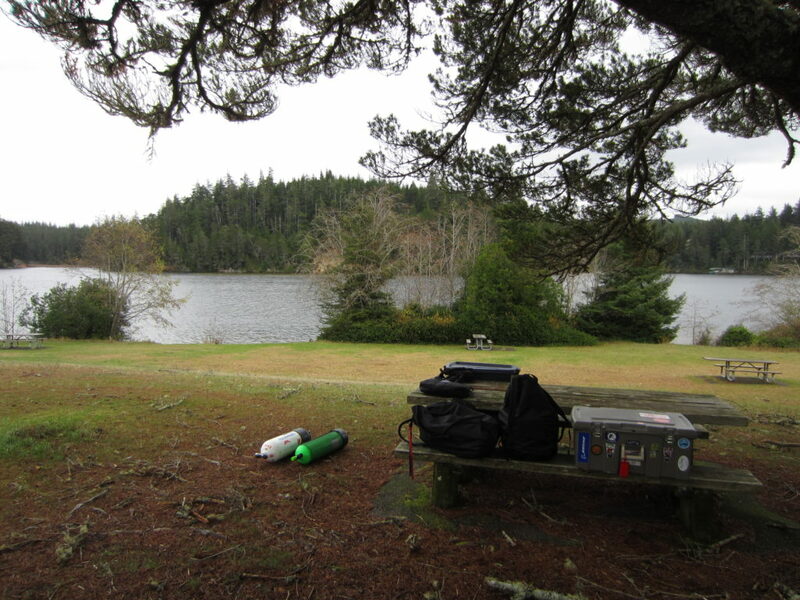 If you have a larger group, part of the group can stay on shore here cooking lunch or heating up water for hot chocolate while the rest of your group is diving. The main highlights of this site are the pickup sticks pile of sunken logs on the south side of the dive site and the intentionally sunken kayak out at the eastern edge of the dive site. There is a variety of life that you might see such as crayfish, trout, the occasional freshwater shrimp, and loads of newts and salamanders. 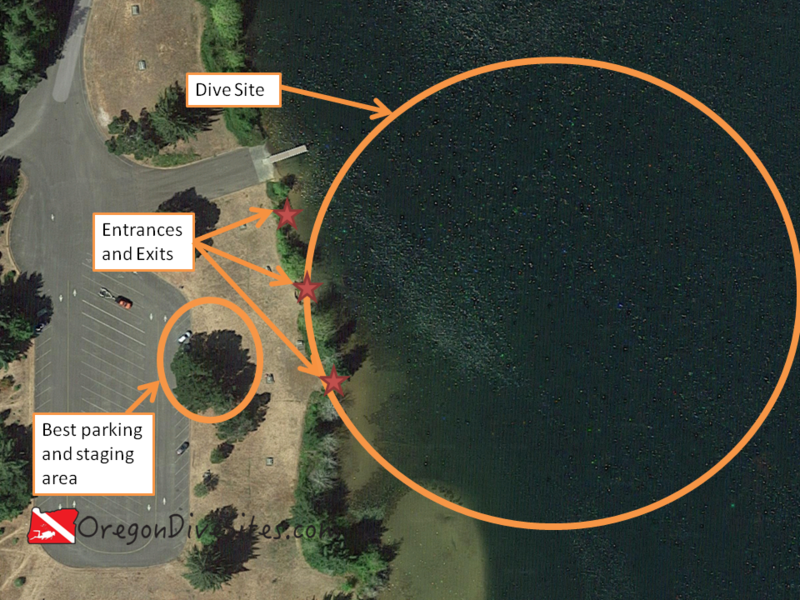 If you dive around the boat ramp, you might find some gear dropped overboard from boaters. The road to the dive site is clearly signed from US101. If you are driving south on US101 from Florence, there is a center turn lane that makes turning left across traffic easier. If you’re driving south on US101 and you see a lake off to your left, you’ve gone too far. If you’re driving north on US101 and you see a light commercial/industrial park on your right, you’ve gone too far. Look for signs for the Jessie M. Honeyman Memorial State Park and Canary Road. Once you’re heading east on Canary Road, you will cross two small bridges. After the second small bridge, take the first right. If you cross a third larger bridge, you’ve gone too far. You will drive down into a parking area. Stay to the left where the road forks. There is car parking along the eastern side of the lot (closest to the boat ramp). We usually park under the trees next to the picnic tables. In the fall, winter, and spring we have never had trouble finding ample parking on the weekends. We have not gone diving in the summer at this site so we can’t report on how packed it gets on hot summer days. Day use parking is $5/vehicle. Woahink Lake East Boat Ramp Site Overview. The dive site is roughly oriented on N-S-E-W compass bearings. When in doubt, head west and you will find the shore. The jumble of sunken logs is due west of the big tree circled in orange in the image above. The entrances and exits that we normally use require some careful foot placement to step up and down from the bank to the small beaches at each entrance point. For those who have trouble with the big steps, you can enter and exit at the boat ramp assuming that there is no boater traffic. It would be worthwhile to talk with a State Parks employee to ask for permission if you are using the boat ramp as an entrance and exit. This is a fresh water dive and is perfect for rinsing your gear after diving at the jetty in Florence. This is a shore dive although you could practice your boat diving skills here if you wanted. The lake is usually calm and quiet. Boaters can add a level of complexity and you should post a dive flag . Usually you get 10-20 feet of visibility, depending on if it’s been raining lately and if sediment has washed in from the surrounding streams. If you stir up the silt on the bottom, things can go down to 1-3 feet pretty quickly. However, all you need to do is swim a little bit in any direction and you’ll be back in clearer water. The silt settles back down to 5-10 feet of visibility after a few minutes and the visibility goes back to normal after a half hour or so. We have seen water temperatures here as low as 43F and as high as 52F. Very occasionally you might experience a thermocline in the top foot or two of the water column if it has been heavily raining. Diving in a dry suit with proper thermals or a 7mm farmer john-style wet suit is appropriate at this site. We know a guy who used to dive here without a hood but we’d recommend full neoprene protection from the cold. Fall, winter, and spring are all great times of year to dive this site. The park is quiet and you often will have the place to yourself. If a SCUBA class is at this site, try the Woahink Lake west boat ramp or the Woahink sunken train wreck. If you really search for it, you can hit 40 feet by burying your gauge in the muck in a couple places at this dive site. Normally you will hit between 25 and 35 feet depending on what part of the site you visit. This site is appropriate for open water divers after they have completed their checkout dives and have been certified. This dive site is easy to dive. Woahink Lake provides an excellent place for SCUBA divers of any physical ability. From the parking lot to the entrance, you have about 150 to 200 feet to walk. You descend down a gentle hill. There is a big step down from the bank to the beach although you can use the boat ramp to enter if the step is too much for you. You can wade out about 20 feet from shore to start your dive or kick out another 50 feet to descend down to about 15-20 feet deep. Watch for boat traffic especially in the summer. A dive flashlight could be useful to look under logs for newts and salamanders. There used to be a shop in Florence although we can’t confirm at this point if it is still open for business. Please contact us if you know of any local shops for air fills and SCUBA gear! The old town area of Florence has several good seafood restaurants. Along the riverfront you can sometimes spot a group of river otters playing on the banks. There are several state park campgrounds near the dive site. We have not tried any of the hotels in Florence yet. If you know of a good place to stay, please contact us.